Information session will be conducted by the Region 3 Manager, David Rye, in Tasmania during October. The sessions are open to ESO executives, members, advocates and those who may be interested in undertaking ATDP training and will provide an update on the ATDP, training and the Recognition of Prior Learning process. Engage is an online portal that current, transitioning, and former ADF members; their families, and/or those involved in their support can use to locate support services. Engage simplifies the process of accessing support by providing information on not-for-profit services available from a range of service providers. What type of support services can be accessed through Engage? How do I access Engage? Engage is accessible through any World Wide Web enabled device. Nominations are called for candidates to attend Level 1 Pilot Consolidation/Assessment Workshops. It is essential that candidates nominated for the Pilot courses have completed all workplace experience and eLearning requirements, in addition to having completed and certified Workplace Experience Logbooks (WEL) and Portfolios of Evidence for consideration that meet at least the minimum evidential requirements. Responsibility for initial conformation of readiness for assessment is vested in the candidate's Workplace Mentor, who then notifies the Regional Mentor (or nominated coordinating mentor). The Regional Mentor is then responsible for notifying the ASO that the candidate is ready for consolidation/assessment. The ASO is then to provide the National Training Manager with the list of potential attendees. Veteran pension payments have increased in line with the biannual indexation. The increase will cover pension recipients including veterans, their partners, war widows and widowers. Due to the calculation of pension rates on a daily basis, the first pension paid after the indexation on payday 28 September 2017 will comprise a component of both the old and new rates. The new pension rates will be fully effective from pension payday 12 October 2017. Pensions are indexed twice a year in March and September. For a full list of pension rates, please visit www.dva.gov.auor call 133 254 or 1800 555 254 from regional Australia. Payneham RSL has established a Veterans' Centre for the use and delivery of advocacy services to the ex-service community in a family friendly environment. It is open to all serving and retired ADF personnel and their families. Veterans Off The Streets Australia, in conjunction with Veterans Health Week, will be conducting a Community Sleepout in Townsville from 2pm Saturday 21st October to 8am Sunday 22nd October. Your health is everything and it’s important to stay on top of it. Being at your best and enjoying a longer, healthier and happier life means taking action. After you have left the Australian Defence Force (ADF), you can access a comprehensive health assessment from your GP to track how you are going. This assessment has been designed specifically for you. It can help your GP identify the early onset of any physical or mental health conditions you may be experiencing and provide treatment or refer you to other services, if you need it. The assessment is available to all former serving personnel. This includes those who have left the permanent force and are now in the Reserves, and those who have left the Reserves. There are no time restrictions for accessing this one-off assessment. DVA will fund the assessment through the usual DVA health card arrangements. If you’re not a DVA client, a Medicare rebate is available. Your GP may decide to bulk bill the assessment at no cost to you. If your GP charges a fee that is higher than the rebate, you will need to pay for the gap. Talk to your GP, tell them you have served in the ADF and ask them about this health assessment. From Monday 18th September, services through the Canberra Veterans’ Access Network (VAN) office will be delivered from the Department of Human Services (DHS) Service Centre at 2–6 Bowes Street, Woden ACT. The Department of Veterans’ Affairs (DVA) announced the move in July. It will provide easier access to services for the local veteran community, including the ability to access a variety of services in one central place. Feedback regarding the co-location from both the veteran community and VAN staff has been positive. The DVA presence is clearly identified within the DHS Service Centre. All Canberra VAN office staff have relocated to the new location and are continuing to deliver the same services to the veteran community as they did from the previous location. The new arrangements will ensure that DVA assistance can be accessed from a modern facility, which has direct access to a large car park and is close to public transport. DVA will continue to work with the local veteran community to ensure the services provided by the Canberra VAN office continue to meet their needs into the future. We are pleased to invite you to attend an Information Session about the Advocacy Training and Development Program (ATDP). Please RSVP for catering purposes by emailing the Region 1 Administration Officer, Tamsin McGuin at aso1@atdp.org.au no later than 20th September 2017. We hope you can take some time to come to one of the Information Sessions and we look forward to seeing you there. Today is R U OK?Day, a national day of action and a reminder to all Australians that you’ve got what it takes to have a life-changing conversation. Use today to start these conversations and as a reminder to keep them going all year round. 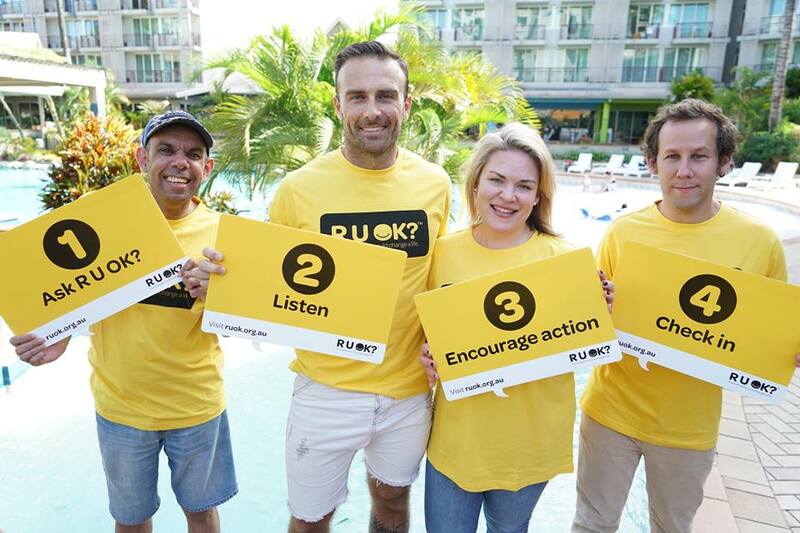 If every Australian takes the time to ask, listen, encourage action and check in when someone around them is struggling, we’ll move closer to our vision of a world where we are all connected and are protected against suicide. Parliament has passed the Safety, Rehabilitation and Compensation (Defence-related Claims) Act 1988 (DRCA), which will replace for Australian Defence Force (ADF) members the Safety, Rehabilitation and Compensation Act 1988 (SRCA). There will be no change to eligibility or the coverage of entitlements or benefits available to current and former members of the ADF. The purpose of this change was to move all military compensation legislation under the Minister for Veterans’ Affairs. Mr Tehan said the legislation gave the Minister for Veterans’ Affairs policy responsibility for all veterans’ compensation legislation. “This new legislation will allow for more consistency for veterans’ entitlements subject to consultation with the defence and ex-service community. This will allow the Department of Veterans’ Affairs to improve the services it offers,” Mr Tehan said. DRCA will commence 28 days after Royal Assent when all veterans and ADF members with existing claims under the SRCA will automatically become claims under the DRCA. Mr Tehan assured the Parliament that there would be no change to coverage in this move but that the Government had put in place a safety net for any unforeseen situations. Any new claims for injuries and illnesses due to service prior to 1 July 2004 which are lodged on or after the commencement date will now also be DRCA claims. Further information on the DRCA, and on making a claim for rehabilitation and/or compensation due to a service related injury or illness under any of the military compensation Acts, can be found at www.dva.gov.au. The above SOPs take effect from 18 September 2017. The Veterans' Entitlements (Statements of Principles—Cumulative Equivalent Dose) Amendment Determination 2017 concludes the previously advertised investigations listed above, please refer to http://www.rma.gov.au/investigations/year/2017 for further information. The above declaration and investigation notice appear in the Government Notices Gazette of 29 August 2017.